Ali and Nino, first published in Vienna in 1937, is one of the enduring romantic novels of the century. An involving tale of love challenged by war, often compared to Romeo and Juliet and Dr. Zhivago, it is as much a story of love as it is a portrait of two exotic cultures. 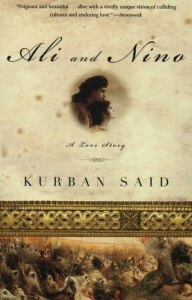 Ali Khan is an Islamic boy from Azerbaijan with his ancestors’ passion for the desert and warrior legends, but his lover Nino, a beautiful Christian girl from Georgia, is the child with a more European sensibility. At once an unforgettable tale of love, adventure and personal heroism, Ali and Nino has persisted in readers’ memories just as the strange background of its author’s life has continued to perplex all who look into it. This entry was posted in fiction, novels and tagged azerbaijan, eastern europe. Bookmark the permalink.